How can ClearTax GST help you? The Monthly Tax and ITC Summary Report helps analyse and keep track of the output taxes paid as well as the input tax credit availed over any particular time period. At the time of filing the annual returns, the taxpayer is required to disclose the summary of all taxes paid during the year as well as the total input tax credit claimed. This report helps in easy comparison with the books of accounts and the quick identification of any anomalies. The total GST liability reported in the annual return should match the GST liabilities disclosed at the time of filing the monthly returns. The Monthly Tax and ITC Summary Report helps with quick and easy cross-referencing of data for the same. The break-up of input tax credit paid through cash and credit helps the taxpayer in reconciling his input purchases to ensure that all credit has been claimed. The report helps taxpayers close books of accounts for the financial year by reconciling his books with the returns filed during the year. This report can help avoid notices by the tax department due to incorrect tax liability reported or excess credit claimed. A revenue invoice issued in a particular month as per the books of accounts has been disclosed at a later month while filing the returns. Input tax credit is claimed in a different filing period instead of the period in which the invoice was raised. There can be reversals of input tax credit due to payment not being made to the supplier within the period specified. There can be differences between the returns and books of accounts due to errors committed while filing returns and thereafter amended in the later months’ returns. A reconciliation of the output tax liabilities and input tax credit is a much-needed measure to ensure that the monthly tax liabilities match with the liability reported in the annual return. Likewise, the input tax credit claimed month-wise should be in-line with the GST purchases made on which input tax credit can be claimed. This process not only helps the filing of the annual returns, but also helps a taxpayer close his books of accounts. Further, it would help prevent notices being issued to the taxpayer due to mismatches between the monthly and annual GST returns. 4. How can ClearTax GST help you? ClearTax GST offers easy imports and downloads of GST data for preparation of GST returns. It provides various options for a user to ingest data to prepare the GSTR–1, GSTR-3B or GSTR-4 in minutes. Options like excel ingestion or direct integration with ERP are available for importing sales or purchase data into ClearTax GST software. A user has to import the sales data for GSTR-1 just once. Based on this, the software auto-populates the details into GSTR-3B in a click of a button. Thus, one can avoid errors and ensure 100% accuracy in reporting of data with minimal manual intervention. ClearTax GST also provides useful insights under the REPORTS section so you can speed through the journey of GST compliance in a hassle-free way! One such report is the ‘Monthly Tax and ITC Summary Report’. This report can be obtained for any time period. Even if the user has not filed the return on the Cleartax GST software in the past, the report section will allow the user to download this data from the GST portal, and compare the same. This report will help the user analyse and compare the tax liabilities as well as the input tax credit availed. It would also help the user understand the input tax credit utilised from both, cash and credit ledgers. This will be particularly useful when preparing the annual GST returns. You can also compare data at a GSTIN level or cumulatively at a PAN level. Download the Monthly Tax and ITC Summary Report anytime to analyse data across months. Check the total tax liability and input tax credit along with the break-up of taxes paid through both – the cash ledger and the credit ledger. Know the tax liabilities on outward supplies and reverse charge, as well as the input tax credit on a monthly, quarterly, or annual level. Data comparison at a PAN and GSTIN level is available. Download the data in Excel format for easy saving and sharing of data. Use data for cross-checking when preparing the annual GST returns. 1. Login to your Cleartax GST account at www.cleartax.in/gst and click on the Reports tab. 2. Select the financial year for which data needs to be compared, and generate the report. If GSTR-3B is filed using the Cleartax GST software, then the report is automatically displayed. 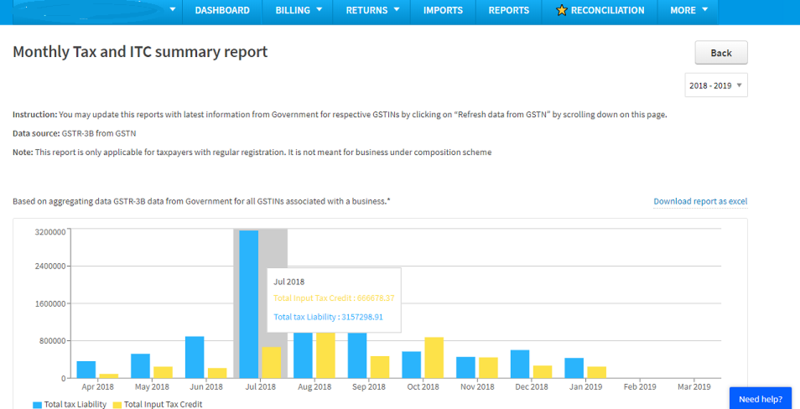 However, if the Cleartax software hasn’t been used before, then click on the button “Refresh data from GSTN” appearing on the right-hand side of the report section. The yearly data from the GSTN will be fetched after verification via OTP-based login credentials. 3. Download the report by clicking on “Download report in excel” to use and share the report in excel form.